Nothing improves a business like great customer service. When customers find a store that offers good support, an easy returns process and clear communication, they’ll return to it time and time again. That’s why returns management should be top of your agenda. Jetti enables you to offer your customers a simple, speedy and reliable returns process. And that’s worth its weight in gold. With Jetti, you can issue returns authorizations automatically, as soon as your customers request them. The whole process is managed for you, which is great news - particularly if you’ve got some returns headed to your inventory and others to vendors’ inventories. Jetti even provides returns shipping labels to make the process totally pain-free for every customer. 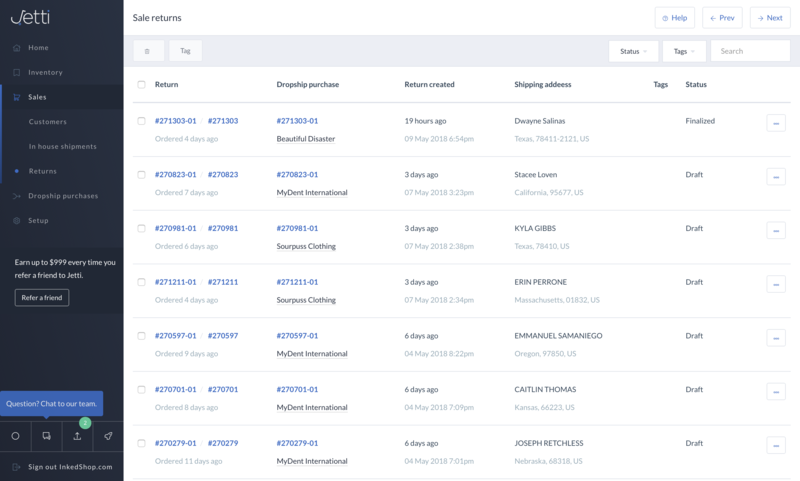 Once the customer sends their return, you can track it via Jetti’s automated system. In fact, you won’t have to lift a finger, because we’ve got the whole process covered.